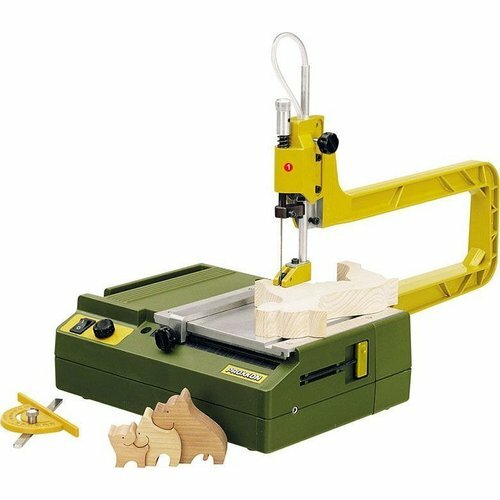 Cuts soft wood up to 40mm, hard wood up to 10mm, plastics (including PC cards) up to approx. 4mm and non-ferrous metals up to 2mm. Plane-milled die-cast aluminium table (160 x 160mm). Saw frame with 300mm throat made from very stable ribbed die-cast aluminium. Blade guide with integrated blower. Height adjustable head (3 positions) offering important advantages (see description on the right). Low noise and persevering AC motor with high life expectancy. Quiet and wear-resistant drive via toothed belts. Adjustable mitre fence and angle stop with scale. Includes 5 saw blades (3 coarse-toothed and 2 fine-toothed). Technical data: 230V. 85W. Electronically controllable stroke rate from 150 - 2,500rpm. Weight approx 2kg. The lowest head position still allows blades, shortened by 60mm, to be used. The machine looked a lot larger in the photos than what it really is. Still it is well made and works very well. The drawback is I am struggling to find blades for the saw. Loot are struggling to locate a supply, and one needs to be aware of this before purchasing. Is it up for a lot of hard work, not sure, but it is not grate on hard wood, best for softwood and thickness up to 20mm. Be sides struggling to find blades it is a good machine and am happy with it. When the blades are sorted out I will be a happy chappy.